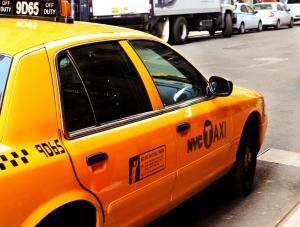 For parents that live in a city, travelling by taxi can be an everyday occurrence. Of course, you’ll be taking your child along with you sometimes, and that means you’ll want to have them in a car seat, too. Accidents happen, but if you take the proper precautions you will be able to prevent injuries. Here are some tips for travelling by taxi with your little one. 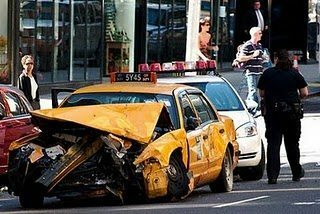 Unfortunately, taxi accidents are a common occurance in the city. First of all, if your child is young or small enough that they should be in a car seat, then they should be in a car seat in the taxi, too! It is not safe to be holding him or her. Rear-facing, 5-point harness restraint car seats are by far the safest. If your child can fit in one, it’s strongly suggested they use it. Make sure everyone sits in the proper position! I’ll get to that a little later in the article. If you don’t have a car seat yet, you can read our reviews to find the best car seat on our website. Never, ever let any child ride unrestrained no matter their age. Babies, toddlers and small children should be in a car seat at all times; holding them or using the car’s safety belts is not enough. An unrestrained person is even dangerous to those in the vehicle that are wearing their restraints; the unrestrained person can become a human missile! Never buckle two people in one seat belt. If there aren’t enough seat belts in the taxi for each person to use one as well as have the car seat properly restrained, it is not safe! First of all, before you board the taxi, here are some things to remember. First of all, buckle your child into the car seat safely and securely. Do this before you even leave your house! It’s a huge pain having to do it inside the taxi or on the sidewalk. Dress your baby appropriately for the current weather. If it’s a cold fall or winter day, layer your baby with a warm cover or blanket. I wouldn’t recommend a snowsuit or other warm clothing; if your baby is too hot inside the taxi, it’s much easier to remove a blanket than a piece of clothing, especially a snowsuit. If you have a stroller, it should be a light and easily-collapsible model that can easily fit into the trunk of the taxi. Choosing the taxi is the next step. Here are some tips for hailing a taxi. When travelling with a baby and car seat plus stroller, the larger the taxi, the better! If you can manage to hail down a minivan or sedan type taxi you will have a much easier time, as these vehicles are easy to install a car seat in and have much more room than a smaller, traditional taxi. Install the car seat in the seat closest to the curb. This is the safest place to do so, and not to mention the easiest when you’re trying to quickly install a car seat in a taxi. It’s much easier to correctly install a car seat when you don’t have to physically climb inside of the vehicle, and in the case that you do accidentally install it incorrectly, it will be much safer on the outside. Don’t close the car door until you are completely finished installing the car seat. This is a signal to the taxi driver that you are ready to go. You might want to consider tipping the driver a little extra to make up for the time you take in installing the car seat properly. I’m sure your driver would really appreciate it. Do I need to wear a seat belt if I’m only travelling a short distance? Of course, the answer is YES! While a taxi ride is generally a short one, going only a short distance, they are involved in a rather large percentage of overall automobile accidents. You’ve also probably heard the saying that most accidents happen within a short distance from the home. Always buckle up! That should be rule #1. What if I don’t have a car seat with me? Can I just go without one? Britney Spears driving with her baby in her lap. This is an absolute no-no! A car seat belt’s main job is to keep you inside the vehicle in the unfortunate case of an accident. Younger and smaller children are far more susceptible to this happening. Furthermore, young and small children will probably have absolutely no benefit from using a regular seat belt rather than a car seat, and might even be exposing themselves to further injury due to an ill-fitting seat belt. 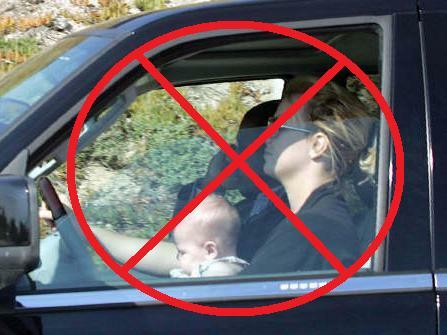 You should never, EVER ride in any vehicle, including a taxi, while holding your child. This is by far the most dangerous way to travel in a vehicle. In the case of an accident, you can’t possibly hold onto the child tightly enough to make sure they stay inside the vehicle, and furthermore, your forward motion could possibly crush and severely injure the child. Therefore, no infant or toddler should ever be in a taxi or any other vehicle without a safety seat. Can I buckle my toddler in with me using the same seatbelt? Absolutely not! This is an extremely dangerous practice, and under no circumstances should you do this. 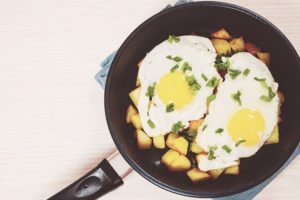 The reason for this is that in the case of an automobile crash, the forces end up giving your body an effective weight many, many times what you actually weigh. This will almost certainly result in you crushing and likely killing your baby. Never do this, ever! Good safety tips for using a taxi when you have little ones to worry about. You definitely don’t want to risk not putting your child in a car seat, even if it’s only for a few blocks. If you can’t have the proper safety provided then it’s time to find another way. Thanks for sharing. It’s good to know, and smart to do, to make sure we take our child’s car seat with us when we travel for the holidays. We’ve never taken a taxi with a car seat before. We were actually considering just holding her while we are in the cab but after reading your advice we have changed our minds. We have never traveled with our baby yet so it’s all pretty new to us. We are so excited for our first family vacation. Thank you for helping us stay safe! 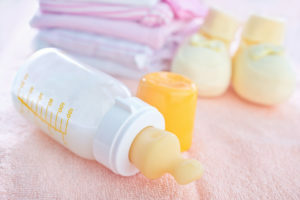 My wife and I just had a baby, and since we use taxi’s quite a bit, we found this article very helpful. It makes perfect sense that a child should be in a car seat in a taxi, and shouldn’t just be held in someones lap. There have been times however, where I have doubled up seat belts before, but it appears that is not the safest option though. Thanks for sharing these tips! Before you try taking a cab with your baby, you should know exactly how your car seat works. You want to be able to install it with ease and not miss a beat so it’s important to practice beforehand. Thanks for the great advice! Some great tips here for travelling with kids. This will be my first time using a taxi service so knowing what to expect before hand cuts down on some anxiety for me. Knowing how best to secure the car seat and all the steps involved is helpful. Travelling with a car seat can be a hindrance but safety for my kids is number 1. Thanks for the safety tips. Great tips! I love being able to take a taxi instead of driving to the airport or around an unfamiliar city. However, it is much harder when you have a baby with you. My only advice is to make sure you know how your car seat needs to be installed. I know it sounds silly, and that you probably already know, but my first time I wasn’t really sure. My wife had always done the car seat before, and it took me a while to get the seat in. So, practice a couple of times before you need to get a taxi. There aren’t really taxis where I live, so I never really thought about what you do when you have a kid. It would be kind of a pain to carry a car seat around, but I would much rather have a safe kid and be a little burdened by a car seat. I also agree that you should install it on the curb, because you’re much more likely to get hit on the road side. Thanks for the tips. I want to do more traveling with my kids. I didn’t know that you could bring a car seat into a cab! That seems like a great way to include everyone. Thanks for sharing! Thanks for including that you should always be buckled, even if it is just a short taxi ride! I definitely agree that that should be rule number one. If you’re buckling up your child, then you should be buckling yourself up to!